When Martin and I traveled to California a couple weeks ago, even though we had various engagements and appointments, we ended up with a lot of unhustled time. Martin and I always have a lot of time together, but usually we’re up to something. We’re trying to get breakfast accomplished so he can board the school bus, or he’s doing homework, or we’re driving, or the bath needs to happen because it’s really late and he should be in bed. In California, we had stretches sitting outside Whole Foods Market munching, visiting new playgrounds, hanging out in a coffee shop because we had an hour to fill, relaxing in the hotel, riding the Laguna Beach trolley. Time. 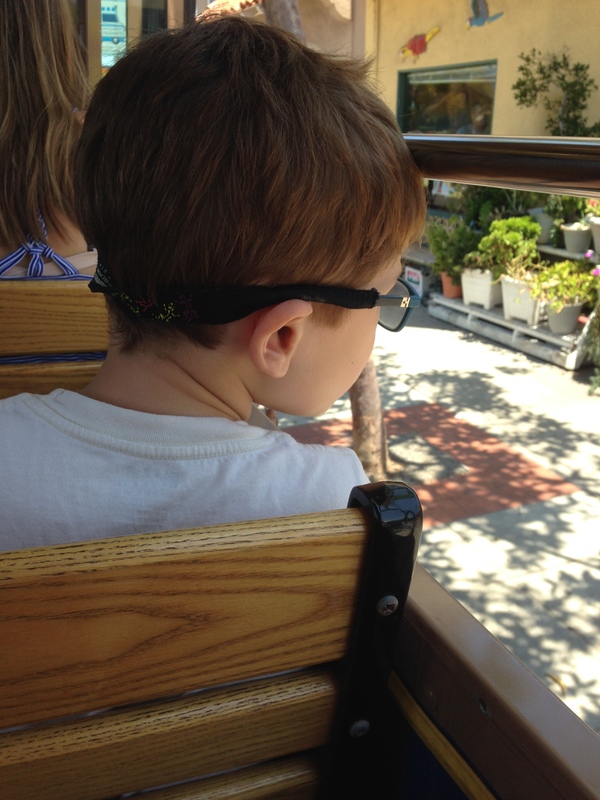 Martin aboard the trolley, taking in the sights. I think we could’ve ridden the trolley all day. It was almost like a renaissance in knowing my son as a person. Martin still perseverates: He talks repeatedly about what interests him, like whether a waiter brought him a new fork when his appetizer was finished. Apart from the perseveration, however, Martin has become conversational. I can ask him a question and reasonably expect an answer, and he frequently adds a new question, or some tidbit of related information. We filled those California times, for the most part, by chatting. Imagine that—we were chatting. Martin, I found out, prefers Southern California to Northern California. He would like to return to Southern California as often as possible. He’s nervous about the ski vacation we’re planning for December. He does not ever plan to become a vegetarian, because he enjoys eating animals. He thinks Taylor Swift is pretty. He will love George, our cat who moved to California, forever. He would rather swim in a pool than in the ocean. He might like broccoli even more than Uncle Eddie does. He misses Adrian when we travel. He considers Will his best friend. Who knew? And who ever thought he’d be able to tell me? Sorry for the poor photo quality. 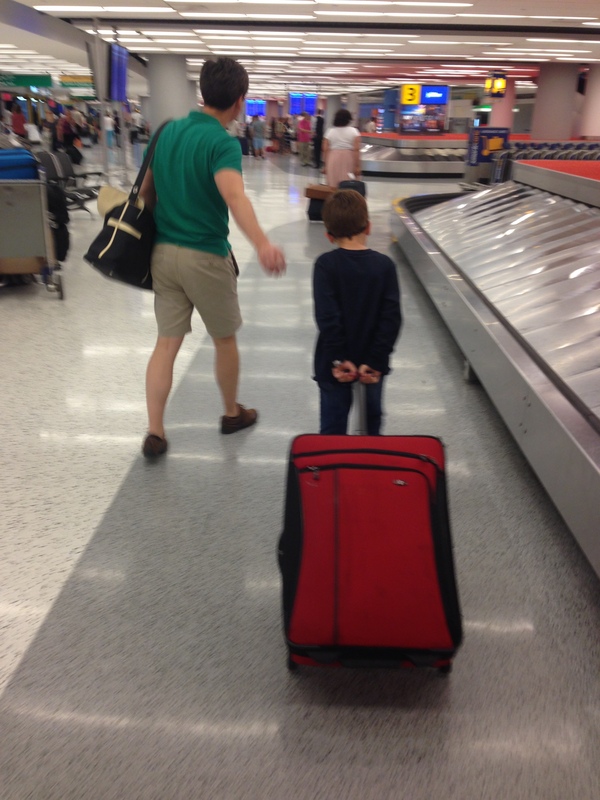 I snapped this shot of Adrian and Martin when we returned to JFK and Martin wanted to help by pulling the big suitcase himself. It’s awesome that he is answering questions and adding to the conversations. That’s amazing!